Army, Marine Corps Generals Say Women Should Have To Register For The Draft : The Two-Way That's in light of the recent decision to lift restrictions on women in all combat positions. The two military leaders made the remarks at a Senate Armed Services Committee hearing. 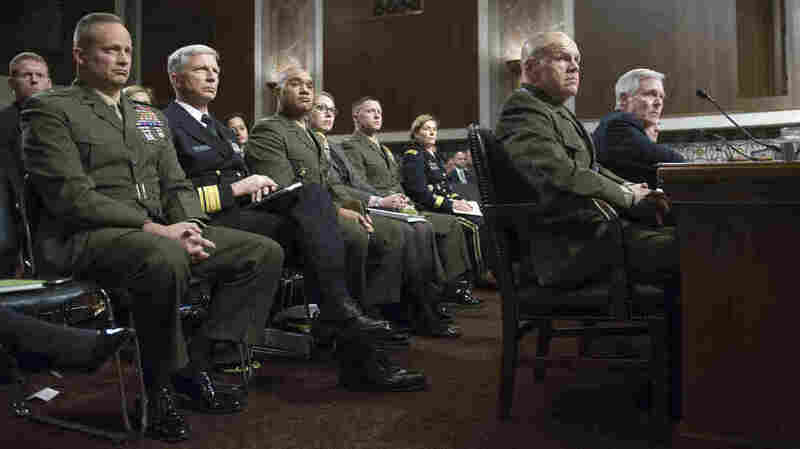 Navy Secretary Raymond Mabus (far right) and (to his right) Marine Corps Gen. Robert Neller testify Tuesday on Capitol Hill during a Senate Armed Services Committee hearing. For the first time, top Army and Marine Corps leaders have testified that they think women should register for the draft. "I think that all eligible and qualified men and women should register for the draft," Army Chief of Staff Gen. Mark Milley said during a hearing of the Senate Armed Services Committee. Both Milley and Marine Gen. Robert Neller said women, like men, should be required to register for the Selective Service at age 18. Tuesday's hearing centered on the implementation of Defense Secretary Ash Carter's recent decision to open up all military positions to women, including front-line combat roles. Other military leaders at the hearing did not immediately endorse the idea. Navy Secretary Ray Mabus said, "This needs to be looked at as part of a national debate, given the changed circumstances." Army Acting Secretary Patrick Murphy also called for a debate about women and the draft. The comments from Neller and Milley supporting women registering for the Selective Service "are a first in the Defense Department," The Washington Post reported. The Selective Service says that nearly all "male U.S. citizens born after Dec. 31, 1959, who are 18 but not yet 26 years old" are required to register. Men in that age group who are immigrants residing in the U.S. also must sign up, with the exception of those on visas. "REGISTER: It's What a Man's Got to Do. It's quick, it's easy, it's the Law." "FEMALES & REGISTRATION: While there has been talk recently about women in combat, there has been NO decision to require females to register with Selective Service, or be subject to a future military draft. Selective Service continues to register only men, ages 18 through 25." It's worth noting that while people are still required to register, the draft was ended in 1973 and the military became an all-volunteer force. Tuesday's Senate committee hearing underscored divisions over how the military should proceed following Carter's landmark announcement in December that all combat roles are now open. That decision dramatically expanded the roles women can take in military operations. "They'll be allowed to drive tanks, fire mortars, lead infantry soldiers into combat. They'll be able to serve as Army Rangers and Green Berets, Navy SEALs, Marine Corps infantry, Air Force Parajumpers and everything else that was previously open only to men," Carter said at the time. The decision was opposed by the Marines, citing a year-long study they conducted that found "gender-integrated units were slower, less lethal and more prone to injury than all-male units," NPR's Tom Bowman reported. At the hearing, military leaders said that "it will take up to three years to fully integrate women into all combat jobs," The Associated Press reports. The issues of women in combat and registering for the draft also have a legal connection. The Supreme Court ruled in Rostker v. Goldberg in 1981 that it was constitutional to draft only men into the military because women were excluded from combat roles. But "things have changed," a federal judge in California said during a December hearing over a lawsuit arguing that an all-male draft is unconstitutional, as the Two-Way reported. As NPR's David Welna noted after Carter's decision, "Congress seems to have lost its court-endorsed rationale for limiting Selective Service registration to males only."